After 20 minutes, uncover the pan and increase the heat to medium, cooking for 15 minutes more or until sauce thickens to your liking. 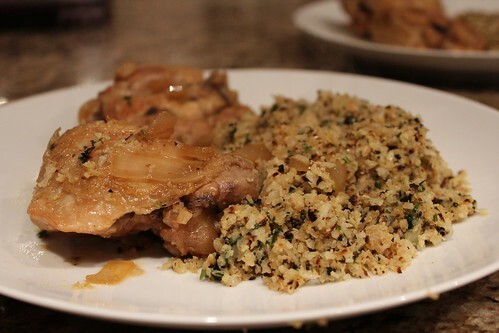 While the chicken cooks, occasionally stir and spoon sauce over the chicken. 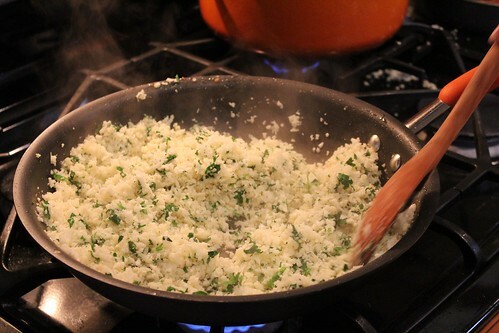 Remove the bay leaves and serve [with coconut cauliflower rice]. Drizzle chicken and rice with sauce. Deliciousness: 5 stars. This hit the spot and reminded me that I need to cook other Filipino foods with my mom and aunt (pancit palabok, pancit canton, pancit bihon, chicken sotanghon, lumpia, empanadas, embutido, leche flan etc.) so I can learn their cooking secrets. Ease of Preparation: 3 stars. 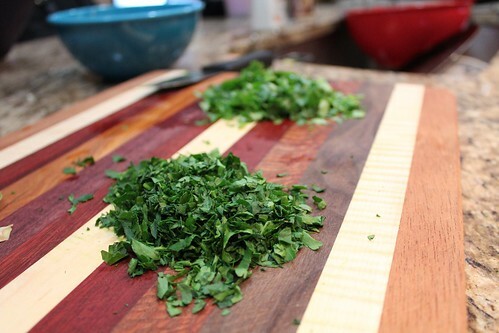 There is a lot of chopping and processing involved, so I am very grateful to my boyfriend for helping out with that. Even with the combined powers of two people, this took us over an hour to make. 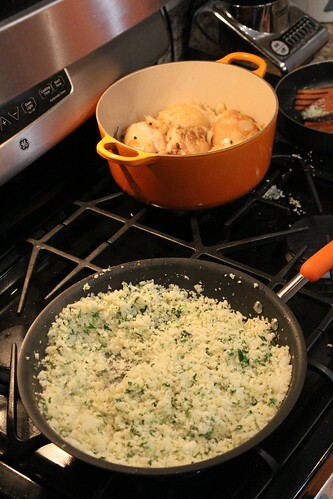 I used my Rachael Ray pan and my Le Creuset dutch oven, and I would have preferred to use a much wider pan for one batch. Leftover Staying Power: 3.5 stars. 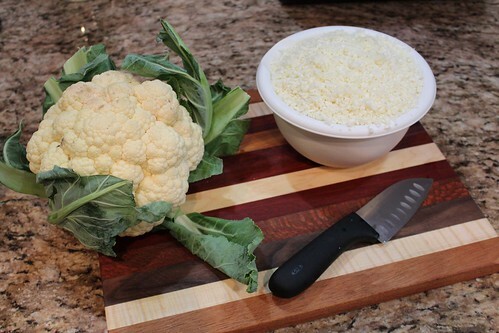 I took some to school two days later, and the cauliflower rice didn't hold up as well as I thought it would. I made the chicken tonight. It was so yummy! I'm tempted to try it with boneless, skinless thighs? Do you think that would work? Awesome! I prefer bone-in, skin-on because of the crispy skin and the extra flavor the bone gives, but my mom always made it without skin (sometimes with bones, sometimes without), so it does work!